What to do when So Cal is hitting 100 degrees? 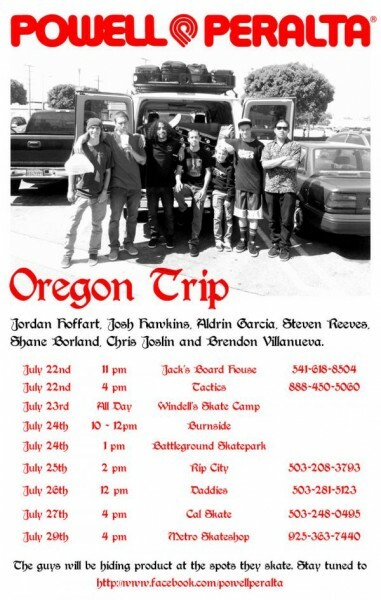 Jordan Hoffart, Josh Hawkins, Steven Reeves, Aldrin Garcia, Shane Borland, Chris Joslin, and Brendon Villanueva decided to road dog it up tomorrow to Portland, Oregon for a week of skating. July 21-July 29 They will be stashing product along the way for you to score. Stay tuned to the Powell Peralta site all week for where the team will be skating, spots where product is stashed, and seeing the action from the road.